The theme of the 2018 festival was the commemoration of the 100th anniversary of the end of The Great War and the contribution of miners during the conflict. Professor Andy Robertshaw, military historian and world renowned expert on The Great War, gave a talk on the subject accompanied by friend and colleague Colin Winn who explained some of the items he brought for display at the festival. 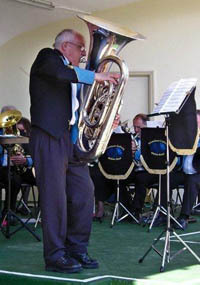 Many local businesses, charities or organisations had stalls and displays at the 2017 Festival and there were performances from Colliery Bands and Hersden Majorettes during the day. Visitors to the Heritage Tent saw displays and videos about mining in Kent. Artist Robert Daniel Oliver was at the festival to talk about his art project based on the Miners’ Way. The kids area had art and craft activities plus facepainting. 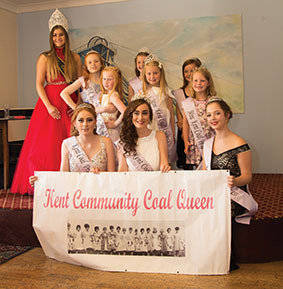 In the clubhouse the Kent Coal Queen selection took place, with young ladies competing for queen and princess titles in age related classes. The Kent Miners’ Festival Dog Show took place at 12pm. We were delighted that our Best in Show Cup was sponsored by Intercrop. The festival beer tent was a great place to relax and reminisce, and a variety of food vendors were on site including Jamie Gates’ Gutbuster Burger bar with delicious burgers and snacks, Veg n’ Out for delicious vegetarian food and The Sunshine Cafe’s festival food for BBQ food run by the Aylesham and District Community Workshop Trust. Wincheap Caterers also offer a range of snacks and desserts. For those with a sweet tooth, Solley’s Ice cream brought delicious Kent made ices and The Candy People have sweet treats to tempt you. 2016 – the main festival was rested for one year. However the Kent Coal Queen competition took place. Unbelievably, the festival suffered from heavy rain for the second year in a row. Some of the attractions decided not to attend at the last minute but the event still went ahead. Musical performances and the Kent Coal Queen Competition took place indoors in the Betteshanger Social Club and the heritage marquee was as popular as ever. The weather dried up in the afternoon, allowing the dog show to go ahead as normal. Stupidity kept on with their performances. So many thanks to all the participants who made the best of the situation and created a great festival for the hardy visitors who still came along. The planning for the 2016 festival will include more contingency for bad weather. The festival was held at Tilmanstone Welfare Ground for the second year and although torrential rain made the event a washout, on reflection the event was still a success for everyone who came along. Events on the field and on the stage had to be curtailed but the boxing went ahead and the Heritage Marquee was, once again, a great success. The usual displays and photographs about the history of the Kent Coalfields were on show and representatives from Elvington & Eythorne Heritage Group, Aylesham Heritage Group, Betteshanger Heritage Group and Chislet Heritage were there to speak to. This year’s special attractions included a display of three original Tilmanstone Colliery banners which have been donated to the Elvington & Eythorne Heritage Group. Also this year, for the first time, the unique embroidery created by Pam Buck depicting local mining heritage was on show. The main piece is constructed with hand made felt and is hand and machine embroidered. 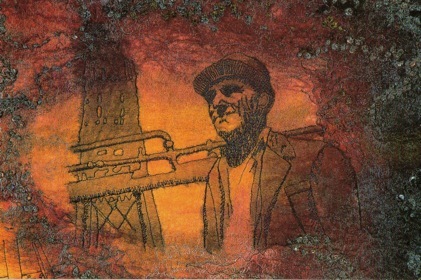 The miner depicted is Robert Job who was also a former historian of the Kent Coalfield. 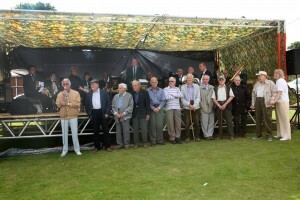 The 2013 Festival moved to a new venue, Tilmanstone Welfare Club at Eythorne. A scorching day provided the backdrop for another memorable event. The Festival was a phenomenal success and a special one in many ways. Commemorating the Centenary of Coaling at Tilmanstone Colliery, made it special for ex-Tilmanstone Miners and their families. Being so successful made it special for its organisers and for those that attended it. The weather, the smiles, the atmosphere and even the odd shedding of tears, meant it was a special day for our Communities. The 2012 Kent Miners Festival was again held on the village greens of Aylesham in the heart of the coalfields communities on 27th August. This year the festival was jointly sponsored by The Co-operative, Aylesham and Aylesham and District Community Workshop Trust, and had received a very significant grant from “Level 1” – Dover District Council in Partnership with The Coalfields Regeneration Trust. In addition, donations of time and practical help by many members of our community combined to make the 2012 Kent Miners’ Festival possible. This year many favourite elements of the Festival returned including traditional Brass Band music from Snowdown Colliery Welfare Band and Betteshanger Brass Band, live music from choirs, soloists and bands on stage, dancers from DAPA dance school, as well as stunt bike displays, a delicious range of foods to enjoy and information displays from many local organisations. You could even try out a Zumba class or book a free trial music lesson! Boxing displays showed off local talent and teams took part in a Tug of War competition. Expanding the festival, a fun dog show was organised with classes for dogs of all shapes and sizes, and canine displays from Sittingbourne Retired Greyhound Trust, Chancepixies and Guide Dogs for the Blind. 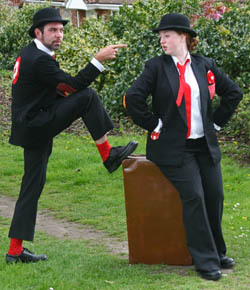 Accidental Collective, a unique drama and music duo, provided an evocative intervention performance within the crowds of festival-goers that explored the idea of belonging. All this made for an exciting FREE day out to remember, for all the family. Come and join us at the 2013 festival on Bank Holiday Monday 26th August, this time at Tilmanstone. The Miners of Kent, past and present, deserve to be remembered and it is important to show this country we are still here and still together as one Community. A hat trick was scored on Bank Holiday Monday with a very successful, third, Kent Miners Festival on the village greens of Aylesham. Two very welcome additions to this year’s festival was Aylesham Co-op, with Alex and his Team and Tilmanstone Salads with Corinna Redsull and the Site Employee Forum, joining us with their sponsorship support. Along with their sponsorship and the many Volunteers who marshalled this year’s Festival; we were able to hold another fantastic Free Community Event. Many thanks to Neville Southall, former Wales International Goalkeeper, not just for opening our festival but also for bringing along his apprentices to assist on the day. Neville works hard in our communities and we would like to thank him and his team of lads for their support on the day. It also gives me great pleasure in thanking all my committee and many others, who worked so hard to put this festival on for all of us. Too many to name them all, they know who they are and I want to thank them for their help and enthusiasm throughout the year. It has been a pleasure to work with you all and I am really looking forward to getting together again soon, to plan next year’s KMF. Thomsetts Coaches, Roberts Coaches, Mark 1 Music, Oatmor Harris and other local businesses all played a part in making this a success. Many people work hard all year round to produce this festival but without groups like Emus, Invicta Marshalling, Beach Grove Community, Marilyn and friends from St Peters Church, St Finbarrs and lots of others, my apologies to those who I have not been able to name but again you know who you are and should feel proud that you all played a vital part in turning this Community Event into a great day out for everyone. Moving this free Community Event into Aylesham, proved to be a good one, when an estimated 6000 visitors turned up to enjoy themselves. Even the weather was with us, no rain this year. Lots of entertainment on stage with the Betteshanger & Snowdown Colliery welfare Bands, who were both exceptional this year. My favourites Masquerade, dancers & singers,who put on two great displays along with Beech Grove Singers & Snaptime Serenaders. The Kent Community Coal Queen, organised by the Aylesham Carnival Court team had another successful year, well attended, well received and well enjoyed. Liz French’s rendition of Kay Sutcliffe’s Coal Not Dole, made a few us old miners shed a tear (could have been her singing). Then, FatetheJuggler Folkrock, finished off on stage and were so good, the crowd did not want them to stop, they could have played all evening, in fact they came off the stage and sat down on the grass and kept on playing with the happy visitors that did not want the day to end. That old childrens favourite, was here again, Ozzy with his Balloons, he tells us that next year he will come along dressed as a clown, that’s worth coming next year for, just joking, Ozzy, lol. One new addition to this year’s festival was our show arena, George and his Team, put on two fantastic Stunt Cycle shows; they were very popular and came with their own fan club. Our very own local Boxing clubs with guests from Hastings, Folkestone and Ramsgate, displayed their skills in the arena and were also a great hit with our visitors. Stevie, with her Four Paws and More Dog show was something new for this year and along with Greyhound Whippets and German Shepherds Rescue joining in, we hope to build up on the animal side next year.